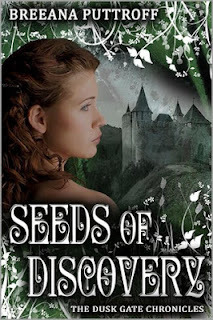 Recommended to: Fantasy readers who enjoy a fabulously written story line coupled with a gorgeous new world. Quinn finds herself smack in the middle of a modern-day fairy tale, on a course that will change her life forever. Going in to Seeds of Discovery was like walking in to a blank room. I hadn't read the synopsis. I only knew that the book cover was gorgeous and it was Fantasy, so of course I'd read it. That was the best possible choice! I went in knowing nothing, and fell in love all the more for it. Let me start out by saying one simple word: immersive. This is the type of book that will grab you, pull you in, and lock you in the world that it builds around you. Quinn Robbins is such a great character. She's sweet, just popular enough, and down to earth. She manages to be both bookish and a social person at the same time! Go figure that you can have both those qualities, right? From the very beginning I fell in love with her demeanor. Quinn is the type of girl that I saw a little bit of myself in, from all different facets. Following her is so enjoyable that it's easy to get lost in the story. The other characters aren't overshadowed though. William, Thomas, and all the rest shine in their own way as well. Puttroff builds a cast of characters that makes it easy to see why Quinn becomes so torn near the end of the book. If I had to choose between two wonderful existences, I'm not sure which one I would choose either. William was especially wonderful. I liked the slow growth that he showed as he opened up to Quinn. These are characters who make it simple to fall in step with them. It really enhances the story. As for pacing, overall Seeds of Discovery is extremely well done. It does start out a little slow admittedly. Mostly to build back story for what is to come. Once Quinn steps foot into the new world, everything changes. I know that sometimes it is tough as a reader to completely immerse yourself in the world that the author builds. For me, that wasn't the case here at all. When Quinn stepped foot into William's world, so did I. I could smell flowers and see buildings. Breeana Puttroff doesn't over-describe, but still manages to allow you to get the full effect. I know this review is getting long, so I'll stop here! Minus a few small issues I had as a reader, I really fell head over heels in love with Seeds of Discovery. This just once again proves to me that just because a book is Indie doesn't mean it can't be amazing! Breeana Puttroff's book is the whole package. Beautifully written, easy to immerse yourself in, and a joy to read. Lovers of Fantasy novels, rejoice. This is one that you'll want to read again and again. The best part? There's more to the series! I can't wait.